The Washington Huskies football team got off to their best start in over a decade this year. The Huskies started 4-0 and reached #15 in the rankings. Head coach Steve Sarkision seems to have taken the Huskies closer to returning to the dominance the program enjoyed in the 80’s and 90’s than any of his recent predecessors. Upon inheriting a team that had notoriously finished at the bottom of its conference for the better part of a decade, Sarkision was tasked with changing the culture at Washington. A $280 million renovation for Husky Stadium, completed prior to this season seems to have helped to provide the Huskies with the mojo they needed to turn things around. Signage was a key part of the renovation and Sarkision had his finger on the project every step of the way. The head coach was amongst the group of people that had direct input on the signage that contributed to the stadiums renovations. 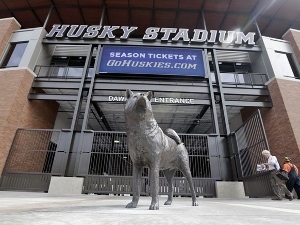 •	Acrylic and tempered-glass panels depicting former Husky greats were erected throughout the stadium to remind fans and players of the schools rich history of greatness. •	Aluminum, purple and gold signs depicting the school’s iconic “W” logo were constructed in various sizes and placed throughout the stadium. •	Painted aluminum and acrylic letters that conveyed messages designed to enhance team spirit were applied to walls and metal screens. Well-designed and produced signage has the ability to energize and inspire a group of people whether it is in an office or a football stadium. The environment that you work in is certainly reflected in your work and signage can radically enhance an environment. Steve Sarkision has worked hard to change the culture at UW and signage is partially responsible for his success.